Voted the best karate school in WNC 3 years in a row by Asheville Citizen Times News. The only karate school in Asheville to perform 21 consecutive years in a row at the civic center’s toughman contest. The event was sold out long in advance year after year. 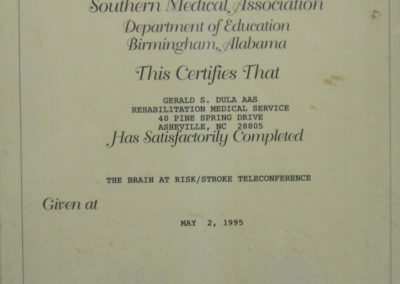 In 1975, students of Mr. Dula received “most likely to succeed” award. His school has been in business longer than any karate school in the history of Asheville, teaching by far more students than anyone. Mr. Dula has a degree in Physical Therapy and has worked at the V.A. Medical Center for 32 years, serving the Veterans. He also served 4 years in The U.S. Air Force. Mr. Dula teaches from life`s experiences. 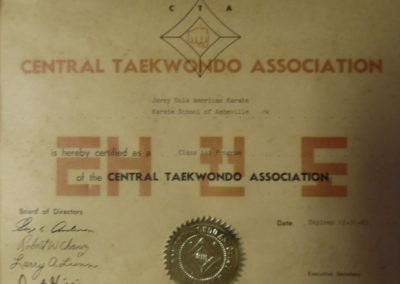 He is the highest ranking Black Belt in Asheville, studying Karate for 46 years. 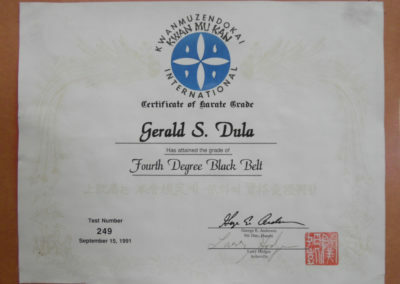 Mr. Dula has a certified Black Belt in 4 different styles: Shotokan (Japan) Shito Ryu (Okinawa) Tae Kwon Do (Korea) and Go Shin Budo (China and Okinawa). Mr. Dula`s school performed a karate demonstration at the Toughman Contest for 21 yrs. in a row. He had a couple of students that won the contest year after year, he teaches you how to fight for real. He has a student that just graduated from the Naval Academy and now is a naval Officer in charge of a ship. Another student just got promoted and is a Doctor of Physical Therapy at East Tennessee State University. These are just a couple of examples of what Mr. Dula`s students achieve. His school won the best karate school in WNC three years in a row. He has studied all over the world, fighting in tournaments in the Philippines, Thailand and all over the U.S.. Mr. Dula has won many World sanctioned tournaments. Mr. Dula has promoted over 200 tournaments in the last 40 years, giving students self-confidence and true life`s experience out of the karate school. Mr. Dula has former students come by the school frequently giving Mr. Dula thanks for holding them responsible for their actions. Mr. Dula would like to send you a personal invitation to come by 1085 tunnel road and see for yourself what you can achieve.